The only racing games I've really played and enjoyed are Crash Team Racing and Wipeout HD. CRASH TEAM RACING IS MY FAVOURITE GAME AND MY CHILDHOOD. It's so good. Crash Nitro Cart was a big disappointment. Metroid: Zero Mission for the Gabe Moy Advance is a remake of the original Metroid for the NES. In other words, they had just released Fusion, they wanted some extra money, and they will NOT, will NEVER BE, remaking Metroid II. No, that would give the fans what they wanted, and make up for Other M (thebabythebabythebabythebaby). In fact... instead of reading my review of Zero Mission, why don't you watch this lovely video of a fan remake of Metroid II?? ...wait, I can't get away with that again? Darn. Onto the review, then. Of course, being a modern interpretation of such a classic game, it does many things right, and many things wrong. The beginning of the game is a cakewalk when compared to the original game: you actually start out with a full energy tank, and you can easily kill the Skree (bat creatures that fall from the ceiling) before they hit the ground. Additionally, a number of other new power-ups make the early game easy as PIEH. For example, the Power Grip. And the fact that you can have both the Ice and Wave beams (both of which are found in Norfair in this game, instead of the Ice Beam being originally found in Brinstar, but also in Norfair). However, in many ways, these power-ups can also be a detriment: until you get the High Jump Boots, the Power Grip can end up being a very irritating power-up indeed. Additionally, the way many areas of the game have been redesigned in order to accommodate the new power-ups is absolutely frustrating, and, in my opinion, greatly hinders your desire for exploration (unless you're a completionist, in which case, have at it!). 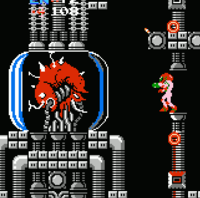 Also, until the very end of the game, when you get the Space Jump, the Screw Attack can turn out to be very useless, because you often end up killing many frozen enemies you want to use as platforms, or it ends up throwing off your well-placed jump, an issue that still was not resolved from the original game (this issue can particularly be seen in the escape from Tourian). 1: They don't stay frozen very long. 2: You have to kill all of them to advance. 3: The hit detection in this game makes it a lot more difficult to kill them, ranging from anywhere to your missiles completely flying by them, to a simple tap from one of them being enough for them to latch on and begin draining your very life essence away. The Zero Mission sequences were very entertaining, tense, frustrating, and frantic (and a result of Samus' incompetence during space battles). How sweet my revenge was when I came charging in with my new Gravity Suit and Palsma Beam, killing all those nasty Space Pirates who had once tormented me... :3 The final boss is a bit of a joke, and can easily be dispatched with a handful of Super Missiles (depending on the size of your hand)- the real final boss should be, in fact (and is really the secret final boss of the game), the SLOW-AS-ECH maintenance robot that blocks your path several times during your journey through and out of the Space Pirate Mothership. Now that's a worthy opponent (and Super Missiles don't even damage it! WOW!). + Vast improvements over the original. Obviously. + WOAH LOOK AT THEM GRAPHICS. + New Zero Suit sequences. + You also unlock the original Metroid for beating the game, so you can play Metroid while you're playing a remake of Metroid. + Tries to be like Super Metroid and Metroid Fusion. - ...different?... from the original. - Screw Attack is same Screw Attack as in Metroid until the end. - Paradoxical difficulty levels, fluctuating from easy to hard and back to easy. - No Metroid II remake. - But it isn't Super Metroid or Metroid Fusion. Give me a Metroid II remake or give me death... wait, no. I want to live! BEAT the marketing director! Not because he's made any bad decisions, but because there's no Metroid II remake! Which is actually a bad decision. Good. EDIT: I need a proofreader. I think. There's a time an place for everything. Now is the time I define my rating system. 0/10: Play this game at your own risk. If it's not so bad it's funny, it's probably more dangerous to be around than nuclear waste. 1/10: This game is really bad. Please, don't play it! 2/10: This game is pretty bad. I'd recommend you don't play it, but whatever. It's your own health at risk. 3/10: This game is bad, but it's just barely good enough to be bearable. 4/10: This game is bad, but it probably has something to save it from being worse. 5/10: A mediocre game. Meh. 6/10: This game isn't exceptional, but it's not bad. 7/10: It's a fun game, and I enjoyed it, but it could have been so much better. 8/10: This game is pretty good, actually. 9/10: What an exceptional game! I greatly recommend it! 10/10: AUEIFGAVIAHEUIRHUGIHRUIG. THIS IS A GREAT GAME. PLAY IT. 'Great,' you say. 'You wasted my time giving me a clear vision of what I already had a fair understanding of. A 0 is a bad score, a 10 is a great score.' BUT WAIT! 'What do the decimals mean, then!?!?' I say. 'Uh,' you stutter, 'games that, uh, aren't bad enough to be the number below, but aren't good enough to be the number above?' 'NOT QUITE!' I state. You see, for all intents and purposes, the score is the number above it. For example, you could consider a 7.5 as an 8. But, in fact, it is on the lower spectrum, so to say, of an 8! It's an 8, but it's not as good as other games that are an 8, not as good as a 7.9, not as good as a 7.8, etc. all the way down to 7.5. In essence, it's a way of dividing games into further sub-categories in order to give you, the reader, a better understanding of how I feel about a game. In some ways, it's just a method to drive people mad by giving their favorite game an 8.9 instead of a 9. That's just a fancy way of saying that the games aren't bad enough to be the number below, but not good enough to be the number above, isn't it. Who doesn't love Shrek!?!? You'd think it would be easy to make a halfway-decent Shrek game, sell it on a variety of consoles, and make tons of money on it, wouldn't ya say? Well, the developers of this game prove me wrong. I think I have made it quite clear how, despite a few exceptional examples, I don't really like too many racing games. They're not really my cup o' tea. In racing games, it's easy for the game to get to the point where it's nearly impossible for you to catch up with the opponents, but they are always able to go just fast enough for them to get past you without too much trouble. It's easy for the controls to be fickle. It's easy for there to be mechanics which greatly hinder you, but seem to have no effect on the NPCs. Blah, blah blah, etcetera, etcetera, etcetera. This game is no different. But the thing is, it's like the developers of this game didn't even try to make a good, enjoyable experience. The graphics are fine, but if I wanted this game for the graphics, I would've bought Hamsterz Life. I have Hamsterz Life, but I didn't buy it, so there. This game has playable graphics... but so does Hamsterz Life. And, while we're on the subject of comparing games, I'll say that Hamsterz Life has more memorable audio, sound, music, and everything else otherwise (gameplay included... and hamsters are cuter than ogres and donkeys, right?). One thing this game has over Hamsterz life, and I will give them this, is the characters. They got Shrek, they got Donkey, they got Puss in Boots, they got Princess Fiona, they got Lord Farquaad, they got the Disney princesses (Snow White's a Disney princess, right)... I'm just gonna stop here and say that they got everybody! You'll break the skin on your thumbs and bleed profusely by the time you've tried all the characters. Not just because there are so many (the DS has nice buttons, actually), but also because this game is so terrible. On that note, you might break your screen also. In addition, now that I mention characters, I'm not sure why you'd have a reason to pick any character over another, bar preference. Wikipedia says that they "have special stats that are not displayed in the game," but I never noticed any real difference between the characters. That could explain why the NPCs always had an advantage over me, but then again, I could never do much with any character. This game doesn't do much. This game has a weapons system, I believe. Weapons are fun, right? NOPE. Not always! These weapons feel shoehorned in, and they're not even weapons Shrek would use! Shrek would like to use flamethrowers, am I not mistaken? Well, this game doesn't have flamethrowers, so stop looking for them. If you want awesome futuristic weapons, play Wipeout HD. That's a fairly new game, has a good variety of gameplay, is just difficult enough, and isn't as terrifyingly brutal in all aspects of the game (and it has trophies! But some people... don't want to talk about those...). I can't even remember how many times I got ahead, was just about to win, but the NPCs always was able to speed ahead and leave me in the dust. I maybe won one race in this game. MAYBE. I got a foggy memory of this game. It's not something I like to remember. Too traumatic. In short, this game gets too frustrating, pointless, and unenjoyable too quickly- you begin to feel helpless. You want to keep playing, you want to get better, you want to enjoy the thrill of winning and losing, you want to win over the game*, to triumph, to tell it you're the boss, to put it in its place, to dominate it, to prove your gaming skill, to assert your superiority in the world... but in the end, you can't bear it any more. This game punishes you for doing nothing- for trying to get better. It's not merciful towards you at all. It's one speed (no pun intended), and that speed is like a bar set way too high (or a limbo bar set way too low, depending on how you look at it). Now, to conclusions. Why did I just explain my rating system in my previous post? Because I want you to know just how deplorable this game is. I hate this game so much that I gave it to my older brother, and he actually took it. That is love. - Jolly right thumb-bleeding gameplay and character selection. - There is no "playtime" to begin with so it can't be "ogre," right? While we're talking about this game, I didn't buy it either- I got it as a gift. If I actually bought this game or wanted to buy it, I'd feel bad about myself for the rest of my life. I feel absolutely terrible just having played this game, though. If Shrek Forever After was the only Shrek movie, I'd be content with that, as long as this game never existed. You'd be pushing it with Shrek the Musical, though. I'm not too sure how I like musicals compared to racing games. *By the way, you just lost it. I SHOULD HAVE REVIEWED SPECTROBES! I will steal an idea from be inspired by Blueflower and do something that isn't necessarily a game review. Serious this time. Insanely serious. Or, "The Music of Chris Hülsbeck: Turrican 3 (Amiga) vs. Super Turrican (SNES) vs. Mega Turrican (Sega Genesis)"
Mega Turrican is a very interesting case: the game was originally going to be released on the Sega Genesis, and then ported to the Amiga, but for some reason, the Amiga version was released before the Genesis version. Both Turrican 3 and Mega Turrican, thus, were very similar, bar a few changes. Super Turrican was more like the classic Turrican games (not that Turrican 3/Mega Turrican were all that different, though). Many of the settings were less industrial than those of the other two games, and the inclusion of a laser beam that you could move all around you (which was replaced by a grappling beam in Turrican 3/Mega Turrican) further tied it closer to the originals. Also, you fight a giant Xenomorph at the end, and not the Machine. There's one thing that ties all these games together, aside from the fact that they're part of the same series: their music. Specifically, I will be analyzing two pieces from each game, "Stage 1-1" and "Stage 1-3" (1-2 on Genesis). Below, you can listen to each of the three versions of the song. The Amiga version of the song is the bare bones version of the song. It doesn't present the song to its fully quality, and in many places, the song feels as if it's missing something (clearly noticeable at 0:27- compare the other two versions of the song at this point. It's as if there's a slight awkward pause where another instrument would have been in the other two versions). It's simplistic, not top quality, but it's certainly not bad- just acceptable. Out of all these three, Super Turrican doubtlessly has the most superior and realistic sound quality. But, like the Amiga version, it almost sounds lifeless and flat. Sure, the music is there all the same, but it just doesn't have the same quality of the Genesis version- you could say, it's not as intense or compelling. It's just sort of "there" in the background, as if it almost has a monotone or bland sound to it, and in my opinion, it doesn't do the composition justice. The Mega Turrican version of the song, on the other hand, has layers (like an onion, I guess)- the "poppy" sound of the Genesis, as I've heard it be called, gives depth to the song, and the multiple instruments only serve to give each layer a distinctive quality to it. In my opinion, this is definitely the superior version for these reasons. Going back to my earlier comment about the "poppy" sound, you can easily hear the difference between songs on the Genesis and SNES. A prime example would be the Hyrule Overworld from A Link to the Past and Casino Night Zone from Sonic the Hedgehog 2. Both are wonderful songs, but their style is different. The SNES has an almost regal-sounding quality to it (particularly emphasized in the song I chose), as I would describe it, but the Genesis has a type of "radical" quality to it. Another interesting video to watch on this matter would be SNES & NES soundtrack on SEGA Genesis sound chip. Now, onto the next song. 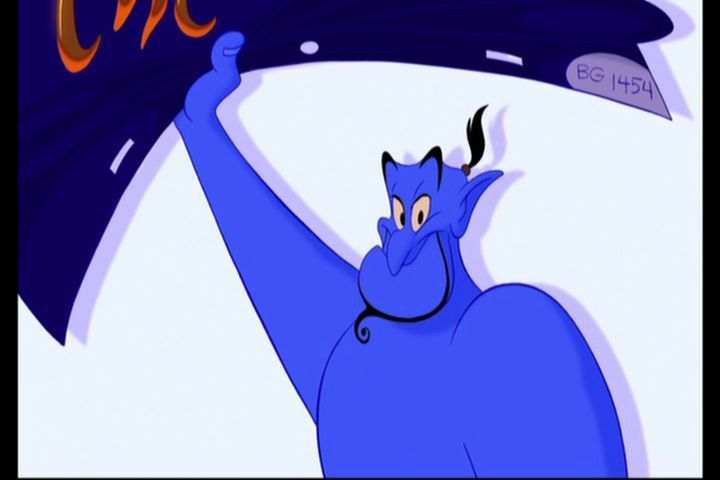 I apologize for not being able to find a plain version of the song without sound effects. But, as a bonus, you get to see what the game is like. Technically, I did find a plain version, but it always seem to glitch every few seconds. My comments about the Amiga version are must the same as the previous song. My only complaint is that is has the pace of the SNES version, but without the energy that it has, which gives it a lethargic sound. Pweh. Now, I'd say that I enjoy the Super Turrican version of this song the same as the Genesis version. Its pacing is different (being slightly slower) giving a different sound to the song. Unlike Stage 1-1, this doesn't come across as being flat or dull. Like with the Amiga version, my comments on this song are very similar, though, when compared to the other two songs, its pace is faster and more lively. The "poppy sounds" come into effect at 0:26, and are simply brilliant. At 0:59, the song gains more layering. Overall, all of these versions of the songs have something different to offer, whether it be simplicity, realism, or a unique sound quality. I don't think any of these versions are bad in any way, and I'd like to hear your opinions as well. I was going to review another game, but I lost the review I was writing. So you'll have to settle for this. 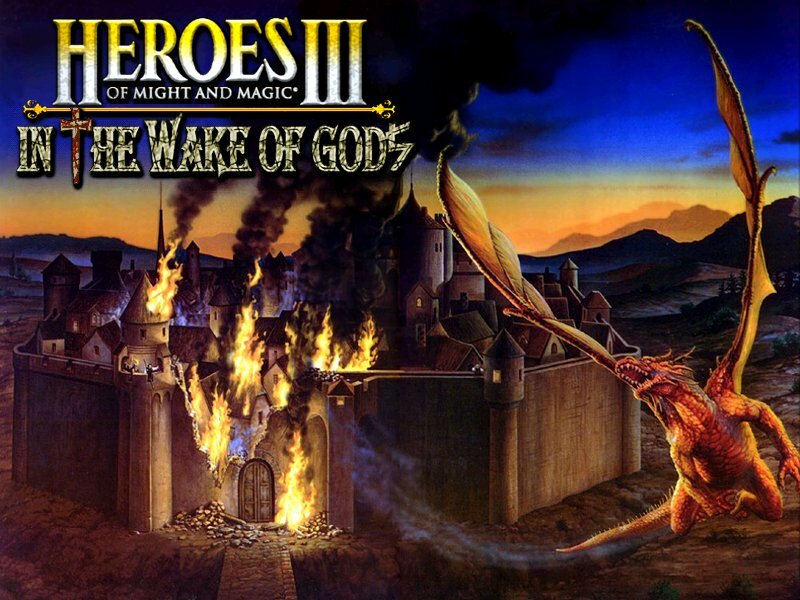 Heroes of Might and Magic III: In the Wake of Gods. It is a fan-made expansion to Heroes of Might and Magic III. I was curious about it, and I mentioned it in the earlier II vs. III review, so I downloaded it. It adds some new stuff, and I guess that's what I should talk about, because if I were to judge it by gameplay alone, it would be the same as Heroes of Might and Magic III. In the Wake of Gods, or "WoG," as it is called, started as an improvement to the Map Editor shipped with the original HoMM III (which I don't think is too bad, but whatever), but later expanded into a full game. WoG comes with six full campaigns of its own; however, I won't be reviewing any of those except for the first one (also called "In the Wake of Gods"). This primary campaign starts out explaining how you are a peasant in a field hoping to become a knight. This first map feels a lot more like an RPG than a strategy game, given the fact that you really don't do any battling in it. A complaint for this map is that the instructions you get are muddled, and half the time, you're just running around trying to figure out what to do instead of actually doing anything. Despite the new tutorial included with the game, the new mechanics introduced (including leaving units on the overworld map, which is involved in a somewhat humorous event in the mission) impede progress as you're constantly doing things wrong, and you have to run all the way across the starting area (or in later cases, the whole map) in order to find hints. Also, in the first map, I found a huge error- there are seven "objectives" that you need to complete, but I only had to do one in order to win... huh!?!? The second and third maps of the campaign are slightly better in this regard, as the second one has battles in it (albeit a bit convoluted, as I will explain later), and the third and final map- for the most part- drops the RPG-esque elements completely for the standard turn-based strategy experience. The second map, as far as I can tell, relies completely on using Ghosts, a new unit based on the Ghosts of the same name from the previous two games, in order to build your army and destroy your powerful opponents. If you don't do this correctly, you'll have to restart the map completely in order to do it right, which, considering that the ghosts die (re-die?) easily because of their paper-thin defenses, and the fact that you don't know what you need to do (defeat several enemies) until slightly-later in the map, can be rather difficult. I wouldn't say that I have any concerns about the third map, but another complaint about the campaign I have is the story (perhaps I was confused because of the lack of completed objectives in the first map): the end of the first map involves you picking up a creature called a Gorynych; the second map involves the Gorynych leading you on a conquest to destroy some towns (with no explanation as to why?) with the Gorynych leaving you about halfway through the map. The final one has you abandon the Gorynych, going on a conquest of your own, and then finally confronting and killing the Gorynych (who has mysteriously gained a ****ton of health). Then, the concluding cutscene goes all psychological on you, questioning whether good can exist without evil, blah blah blah... good? What-I-assume-are-translation-errors also help (I say that sarcastically) with confusing the player about the story, preventing the learning of knowledge which would contribute to you understanding the story more. Campaign aside, all the other changes are great. To start, the title screen art and music have changed, which gives a uniqueness to this fan expansion from the beginning. A lot of creatures are added, including Level 8 creatures (even more powerful versions of the already powerful upgraded Level 7 creatures) and recruitable Commanders for each castle, the aforementioned Ghosts, variations on other creatures (the Messengers, War Zealot, Arctic/Lava Sharpshooters, among others), as well as numerous other completely new creatures (the four Emissaries, which have no usage in combat, but power up your hero the longer they have them, come to mind as prime example), adding more variety in battle. Demolishing a castle- turning it into what looks like a mushy pile of goo- and converting it is a great addition strategy-wise, as it allows you to build power for your "native" faction instead of being forced to keep a captured castle of a different faction isolated from the rest of your forces, acting as only a moneymaking city. Finally, I noticed that WoG tends to glitch a lot less than HoMM III does- I don't know whether that's because the disk is scratched or there are compatibility issues (I'd say the latter is likelier)- which makes playing the game a lot more enjoyable, especially for playing "Multiplayer." With the Map Editor, at first glance, I didn't notice much of a difference from the regular one, with the exception of adding the new structures (a lot of which are snow-covered versions of other structures, which, oddly enough, can ONLY be placed on snow-covered areas; quite a shame, since I liked placing snow-covered objects on non-snow-covered areas)... many of which are just called "Object," which leads to only a vague understanding of each structure for the average user; sure. That's cool. I'll just place a few of these OBJECTS and hope they don't mess up the balance of the map. That would be terrible if they just gave out 100 or so RUST DRAGONS to whoever visits them first. Overall, this is worth a download. If you already own HoMM III Complete, since you need that to download WoG. If not, it's still worth download, if just to look at the icon staring at you. LOOK AT THE ICON STARING AT YOU. + Something else that is thought-provoking and informative. - Bad first taste from the one campaign I did play. - Final cutscene failed to touch me psychologically, mentally, or emotionally. I'd buy it for a dollar! I suppose, since I tried this out, Horn of The Abyss is next. That's been more recently updated, I think. Going back to an earlier question about whether HoMM II or III would win in a battle, if you take this into consideration, I think this definitely evens the playing field, especially by adding ghosts- although they aren't as powerful as they were in HoMM II, they're still great at killing tons of peasants. The result would still be just as bad. Need for Speed: Most Wanted is a most wonderful game. Apparently there was another game with the same name released in 2005, but this isn't it- this is the 2012 one. If you were expecting the 2005 one, then TOO BAD! Expecting me to say "Waluigi time?" TOO BAD. This isn't Mario. So, as I was saying, Need for Speed: Most Wanted is a most wonderful game. You get pretty cars, and you gets lots of them; they don't skimp on the cars! Y'got Fiat, DeLorean, Jeep, Hummer, Cadillac... y'got the Honda Ferrari... I could go on. But I won't, lucky for you. What do you do with all these cars in this most wonderful game, you ask? You drive around town and crash into things. YOU CAN'T DIE. You can come upon other cars and get into them. IT DOESN'T EVEN SHOW YOU GETTING OUT OF YOUR CAR. IT'S LIKE THE PROTAGONIST IS BLESSED WITH IMMORTALITY BUT CAN NEVER EVER LEAVE THE INSIDE OF A CAR. Among the funnest things to crash into are other cars! You just speed along the highway going in the wrong direction until you see someone 'n THWACK! You hit them! BOOM! They flip over the side of the road. See someone else, mercilessly pursue them, 'n THWACK! Again again again! And the police never seem to notice unless you crash directly into them; yay! Mentioning the police brings to mind another aspect of the game. You can goad police into chasing after you, building some sort of heat meter or whatever it's called, until you finally **** them off enough to the point where they send S.W.A.T. trucks to block you. They mean business. If you get cornered by the police cars for long enough, you are "arrested" (busted is the in-game term)... you don't even get your car taken away. You don't even go to jail, you aren't even handcuffed. This lends credence to my earlier theory about the immortality thing. Overall, this game is pretty good. It has a lot of fun and humorous aspects to it, like driving around crashing into things and getting a paint job in the middle of a police chase. Whaa-at ddooo... y...you mm...m...mean... t-this iiss a... raaaccing game? + Crashing into things is fun. + Going fast and crashing into things is better. + Police pursuits give hint of challenge. This is the tenth review! Rejoice or something or not. But the protagonist IS blessed with immortality but can never leave the inside of their car. I love how this game pretty much has the same story as no more heroes except it's drivers rather than assassins. Everything's in the manual, they say. But I don't have the manual. I will be comparing these two games in numerous categories, such as: Gameplay, Graphics, Story, Weapons/Power-ups, and Music/Sound. So, now that you know that, let's go! In Alien Hominid, I was usually dying every few seconds- it's a good thing they give you a ton of lives! HA! Wikipedia compares Alien Hominid to Metal Slug, and to that, I say this: Alien Hominid (GBA version, at least; I haven't really tried any of the other versions) is like Metal Slug where it's impossible to avoid 80% of the stuff you can avoid in Metal Slug; and I can say that safely since I've played Metal Slug. METAL SLUG IS EASIER THAN THIS GAME. A GAME RELEASED IN 1996 IS EASIER THAN A GAME RELEASED IN FRICKIN' 2006 (2004 if you count the earlier versions). What's wrong here people!? And don't get me started about those bosses OOOOHHH. The first two bosses in the game (both in level 1) alone are very tedious as you slowly chip their health away while they kill you repeatedly with their nigh-unavoidable attacks (or at least, very very difficult to avoid while trying to hurt them). The key to this game is button mashing (oddly enough, being a "crazed alien," which the game tells you not to do, is more effective than being "calm"), but when even that's unreliable... When I played this game while doing this review (my third time playing it- I guess the third time is the charm), I did a bit better. The gameplay is also deducted for not having any two-player mode, or as far as I can tell (the game has three minigames, but I didn't play for long enough to unlock them). Also worthy of note is that there is a level select and multiple difficulty settings (I played on "Medium" for the purposes of objectivity), but that pretty much takes away the point and/or challenge of the game. The vehicles in Alien Hominid, too, are (usually) pretty frail and mediocre, something you don't see in Metal Slug (the titular tank is literally that: if you're good enough, you can keep it alive through much of the level, whereas, it's frustratingly difficult to keep the Alien Hominid vehicles alive for very long, let alone to the end of the level). I feel like I'm comparing this game more to Metal Slug than I am to Gunstar Heroes! Speaking of Gunstar Heroes *cough*... Since I don't want to explain to you the basics of shoot 'em up games (you should know what they are; if not: SHAME AND DAMNATION! ), I'll just say what's interesting about Gunstar Heroes. This game forges its own path- you have health instead of merely dying in one hit; in addition to the weapon system, which I will describe later, this gives it much more genuine difficulty (if you die, it's your own fault because you let your health drop too low). Although, unavoidably, some of the bosses are frustrating, it's more-often-than-not able to be worked around with good strategy (instead of merely charging your foes, or using the right weapons COUGHCHASERPLUSFORCECOUGH), and the two player mode makes the game even more fun. Plus, there's even one level in the game where you're in a rocket! Wheee. Well, what about Gunstar Heroes? It's an older game, so surely it won't stand up, right? Wrong-o sir/ma'am. Look at this glory. Look at this glory. Look at this glory. Look at it! This is standards- beauty, even. You can't compare. DON'T. Even try. Story of Alien Hominid: You are an alien flying over planet Earth and your ship is shot down by government agents. They take your ship away but for some reason don't take you to whatever lab/place they take your ship to...? So, for that reason, you get to blow them apart with your laser gun, and that's where the game comes in. Gunstar Heroes is so absolutely awesome, it has two stories: a Japanese story, and a Western one. Alien Hominid barely has one, so there. Go to Wikipedia to read the plots. I'm not going to waste time rephrasing them here. Pah. I personally found the weapons in Alien Hominid to be rather uninteresting, but as far as I could tell, all of them were better than the default weapon, so I just grabbed whatever weapons/power-ups were available. But when you die, you lose your current weapon!!! AAH! 1: The weapons are: Force, which rapidly SHOOTS BALLS; Lightning, which- duh- shoots lightning lasers; Chaser, which- duh- shoots homing bullets; Fire which DUH SHOOTS FIRE. 2: You can have two weapons at one time, which means that you can either switch between weapons, or COMBINE the weapons! This opens up woooorrrlllddddddsss of possibility!... although you know, the best weapon is without a doubt the Chaser + Force (which shoots HIGH-POWERED HOMING BALLS). The background music of Alien Hominid is pretty good, as I feel it compliments the game really well, but it doesn't really stand out in the way the music of Gunstar Heroes or Castle Crashers does; when I played with the volume down, I didn't really feel as if missed anything exceptional or worthwhile. The sound effects are somewhat redeeming however. Somewhat. The music of Gunstar Heroes is great and adds a new level of atmosphere to the game. The sound effects do as well, especially the "HYAAAH!" whenever you throw an enemy, the "HRRRUM!" whenever you get knocked back by an enemy, and the futuristic siren noise whenever the boss battles are beginning. The final-battle music is especially good, as it builds tension as the game states "HERE COMES THE CLIMAX!" and then proceeds to list Golden Silver's attacks: "GOLDEN BLAST NUCLEAR / JEWEL STRIKE / EARTH RESOLVER." 'nuff said. I don't know if this is a case of a bad port, or whether I just find the GBA version of Alien Hominid subpar compared to other shoot 'em ups. 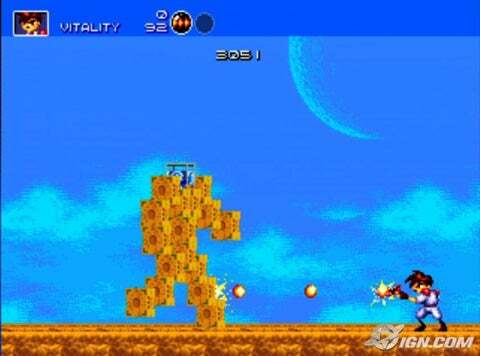 Gunstar Heroes on the other hand... do I really need to say anything more about it? Yes, I do. Gunstar Heroes is perhaps my second favorite game on the Genesis; it's one of those games I need to own on pretty much every console I have. NEED IT. LIKE BREAD. Guess which games I'm reviewing next week!!! You thought I was reviewing Castle Crashers didn’t you you silly squid! Well you were wrong. Ha. I lied. And I fooled you twice you silly little squid. I will be comparing these two games in numerous categories, such as: Gameplay, Graphics, Story, Weapons/Power-ups, and Music/Sound, as with the last pair of games… so let’s get started then! Kessel Threshers is a beat 'em up game developed by The Behemoth; you can choose from a number of characters (depending on who you've unlocked) that can gain different magical abilities as you level up. I chose the Green Knight on my first playthrough: he uses poison-based magic. When you level up, you can also increase other stats, and throughout the game, you can get new weapons and "Animal Orbs" that can give you special benefits or further enhance your stats. Alien Soldier is another run and gun game made by Treasure; apparently, it was originally only released in Japan and Europe (hence the "Mega Drive" title rather than "Genesis"), and was not released at all physically in the US until later. When you start the game, it greets you with such phrases as "FOR MEGADRIVERS CUSTOM" and "VISUALSHOCK! SPEEDSHOCK! SOUNDSHOCK! NOW IS TIME TO THE 68000 HEART ON FIRE!" Huh. I guess so. So when you actually start the game, you're presented with a slew of options: what weapons to choose, which of the confusing HUDs to use, and a list of moves and abilities you can use. There are only two difficulties in this game: Superhard (the default), and Supereasy (the difference being that you cannot use continues in Superhard). This game does not **** with you. It ****s on you. There's no Supernormal. It's as if the game is saying that you can either be a ***** or be a man. I just realized that statement was sexist, and will amend it to say that it's as if the game is saying that you either be weak or be strong. As for the gameplay itself, it's mostly bosses. Wikipedia says that this game "is listed in Guinness World Records Gamers Edition 2010 under the category 'Most boss battles in a run and gun game'." This game takes a while to get a hold of, as it's mostly just preserving your health until you get to the bosses, and then trying to keep your health as high as possible during those. One of the abilities, a teleporting-like ability, is extremely useful for this purpose (as in, you will most likely need to use it a lot). The art style of Crustle Thrusters is very cartoonish, much like Alien Hominid (yet also violent at times); it adds a unique appearance to the game and gives it its own atmosphere, etc. etc. etc. The same thing that applies to Gunstar Heroes applies to Alien Soldier. I'm too lazy to write more about it. The protagonist is an eagle-robot-thing, so I guess I could say that he looks cool? Castle Crashers has a pretty typical story (that still manages to be humorous and all-around entertaining): four princesses are captured as the evil wizard attacks the castle, and you need to go all across the land, rescuing the princesses one by one, as you encounter many kinds of great enemies (bosses) before your final confrontation with the evil wizard and his henchmen. You even get kidnapped by aliens once (yes, those aliens); it's a bit challenging to explain all the minute details of the story. Alien Soldier... uh... where should I start. Just read this. READ IT. In Cushing Mushers, you get a great variety of weapons, some of which raise stats, others which raise some stats but lower other, and even more weapons that DO NOT RAISE YOUR STATS AT ALL (usually the default weapons). According to the Castle Crashers Wiki, there are 83 weapons in all, of which my favorite is possible the Evil Sword. Pretty impressive. The power-ups you get in this game (or other items, rather) vary from things like a Bow, to Bombs, Sandwiches (which make you BEEFY), a Boomerang, a Shovel, and Health Potions. While in the levels, you can find food items that restore your health. Pretty standard fare. Alien Soldier gives you a selection of four out of six weapons from the start: Buster Force, which shoots a stream of energy balls out in front of you; Flame Force, which, uh, shoots a jet of flame out in front of you; Sword Force, which shoots a laser; Ranger Force, which shoots a flurry of projectiles in an arc in front of you; Homing Force, which shoots out flames (?) that bend toward your enemies; and finally, Lancer Force, which shoots a slow laser (I assume it's a stronger version of Sword Force that takes longer between shots). Each weapon has limited energy before it drains, meaning you'll need to collect more energy for the weapons in the levels. My only complaint is that it's difficult to switch weapons mid-level without getting hurt- the game doesn't pause at all while you're switching! The music in Castle Crashers is DELICIOUS. From the title screen to the map, to the first song in the first level, to Jumper, and a lot of other stuff create a diverse tone for the game and enhance the mood for each level (and other locations) in the game, and is just plain enjoyable to listen to. VIDEO GAME MUSIC FTW!!! The music in Alien Soldier is pretty good, but I don't like it as much compared to Gunstar Heroes' soundtrack (there is a remix of the Seven Force theme in the game though, when you fight "Seven Force" at one point in the game). I didn't get to hear much of it in-game (as I only got up to stage 5), so I unfortunately can't say much about it in terms of in-game context, but I did enjoy listening to it on Youtube (although it was mostly just flipping through the songs- I don't have time to listen to each one individually, especially because I'm just going to write a paragraph summary of the whole OST! ). Overall, Castle Crashers is a great game; its art style is great, the gameplay is enjoyable, the music is wonderful; etc. However, on the other hand, I didn't really like the giant boss run feel that Alien Soldier had (because that's literally what it is)- it's still quite enjoyable, but it doesn't have the same impact (for lack of a better word) as other run-and-gun games like Gunstar Heroes have with me. I wouldn't call it a bad game by any means, but out of these two games, the choice is clear. I wish they had a Colonel Sanders statue as a weapon in Chicken Munchers! Alien Soldier has 25 (short) levels and 31 bosses. Yikes. FOR MEGADRIVERS CUSTOM. FOR GREAT JUSTICE.